League Two side Southend United claimed a shock away win against Leyton Orient in the first leg of the Johnstone's Paint Trophy southern area final. Ryan Leonard scored the winner when he flicked the ball into the net from Sean Clohessy's low right-wing cross. The hosts had numerous chances but Shrimpers goalkeeper Paul Smith made a series of fine saves to deny Lee Cook, Dave Mooney and Shaun Batt. 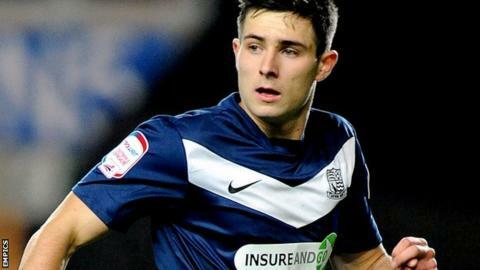 Mooney also hit the bar in injury-time but Southend held on for the victory. The Shrimpers now hold a one-goal advantage ahead of the second leg at Roots Hall in a fortnight's time and the winners will advance to the Wembley final on Sunday, 7 April. Southend United boss Paul Sturrock was taking charge of his 150th game as manager of the Essex side. He has been a manager for 879 games in his career, but he is yet to lead a team out at Wembley. League One Orient started brightly in front of their highest home crowd of the season of 5,359 and had the best chances of the first half. However, Smith held on to a Cook free-kick, saved Mooney's close-range volley and parried two efforts from Batt, who was making his home debut after joining the O's on loan from Millwall last week. Orient's misses proved costly as the Shrimpers, the lowest-ranked side left in the competition, took a 57th minute lead. Michael Timlin released the overlapping Clohessy and his deflected cross fell to Leonard, who bundled the ball home at the near post from close range. Southend's Kevan Hurst missed a chance to double the visitors' lead, shooting narrowly wide from the edge of the penalty area. But Mooney should have levelled the game when he wasted two opportunities. He lifted the ball over the crossbar when he only had Smith to beat and then fired against the bar from close range late on. However, Southend's victory was overshadowed by an injury to Timlin, who was carried off on a stretcher in the second half. The eventual winners of this game will face either Coventry or Crewe at Wembley, with Crewe holding a 3-0 lead after the first leg of the northern final. "I'm gutted for him [Michael Timlin], it's a suspected broken leg. It does look bad. "I'm really disappointed, the lad's been a stalwart for us. He has his good days and his bad days but he wears his heart on his sleeve. I'm just absolutely gutted, it's put a dampener on the night. "It was a difficult game. We decided that we would play nice and tight and solid. The start of the second half was excellent, for about half an hour we got ourselves in the right areas. "I hope it doesn't cause complacency - they've got some players that can hurt us."